Luxury British-style four star hotel! 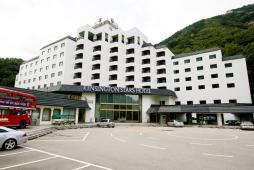 Kensington Star Hotel, opened in 1996, is a British-style four-star hotel on 1,000 pyeong hotel grounds. Boasting its closest view of panoramic Mt. Seorak, it has opened a chapter of stardom with numerous celebrity visits. Former President Park Jung-hee, captivated by the surrounding beauty, often lodged at the presidential suite and office at the hotel, which is still maintained today. Since then, a list of stars including actress Kim Hye-soo, actor Ryu Si-won, singer Shing Seung-hun, Korean national soccer player Ahn Jeong-hwan, and many more have visited. Upon entrance, the hotel interior has castle-like walls and antique designs presenting a graceful ambience. A total of 109 guestrooms are available in 9 room types- Korean Ondol (Stadard Deluxe), Western (Standard Double, Deluxe, Twin), Star Ambassador Floor (Star Deluxe, Honeymoon), and Kensington Suite (Ondol, Western, Presidential). As the world's first star theme hotel, many celebrity-donated items are on display. Come trace the memories of the stars and lodge in their very rooms!